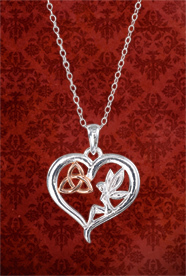 A silver heart encompasses a wee fairy and a rose gold trinity knot - magical elements joined in a wish for endless love and harmony. Sterling silver and rose-gold plate. 18" chain. Love this cute fairy pendant. The trinity knot combined with the fairy is perfect for me. I love fairies & my family background is Irish. This piece looks like the price should be higher. Just beautiful. So happy with it.